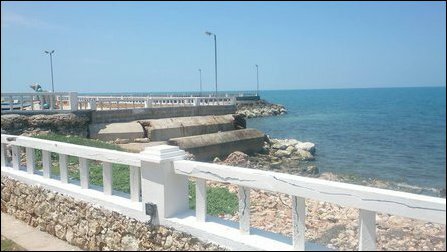 A controversial star-class tourist resort, constructed in the Sinhala military-occupied private lands of uprooted Eezham Tamils in Kaangkeasan-thu'rai (KKS) in Jaffna, is to be subjected for foreign tendering by the SL State, the incumbent president Maithiripala Sirisena has stated in the South. The latest claim by the SL President has triggered strong reactions in Jaffna as the owners of the land were not ready to give up their claim of the lands unless the SL State was prepared to transfer the entire property to the Provincial Council for the promotion of tourism that could benefit the local population under the purview of the NPC Chief Minister. The resort facilities were built for the exclusive use by the former SL President Mahinda Rajapaksa and his family guests, according to rumours in military circles during his regime. It was the military that oversaw the entire construction of these resorts. The properties, still remaining under military-occupied zone have not been in operation since the regime change, but were being used by SL military commanders. NPC Chief Minister Justice C.V. Wigneswaran and the elected council, through a resolution, have officially sought for the transfer of the property from SL military to the NPC ministry of tourism, which comes under the direct purview of Justice Wigneswaran. Two years have elapsed since the NPC request. But, the SL President Maithiripala Sirisena, who is also the Commander-in-Chief of the SL military, has not responded in favour of the request placed by the NPC and its chief minister. It is under these circumstances the SL State and its central authorities are engaged in outsourcing or leasing the properties under 99-year long-term leases to foreign and multinational tourism corporates. Rajapaksa regime had spent 3.5 billion rupees to build at least two star-class resorts inside the military occupied-zone in KKS. The occupying SL military is also operating a tourist resort, with the Sinhala name 'Thalsevena (Palmyra Shade) at KKS since 2010. The SL Navy stationed along the coast in the North-East is engaged in military operation of resorts in the occupied country of Eezham Tamils. 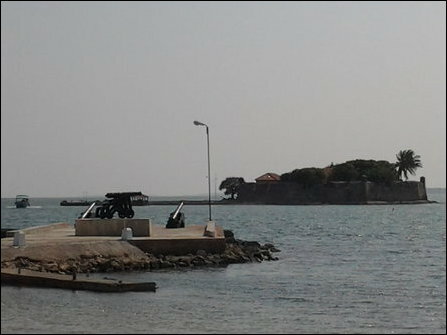 The SLN operates a resort at the old Dutch Fort situated in a tiny islet off Kaarai-nakar in Jaffna and in Vadamaraadchi East in lands belonging to bird sanctuary. The SLN is also preparing to expand the resort in Chu'ndik-ku'lam, informed sources in Jaffna said. 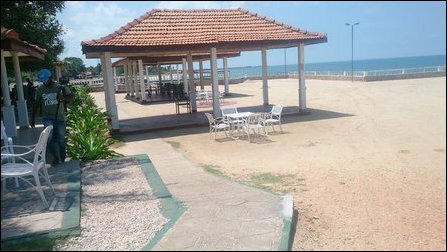 Occupying SL Army's tourist resort bearing Sinhala name 'Thalsevena' (meaning Palmyra Shade) at Kaangkeasan-thu'rai in Jaffna is located at lands seized from Tamils. 24.07.17 Colombo to ‘expand’ bird sanctuary to harm territorial-integ..